Lamborghini Newport Beach is pleased to present the most recent V12 bull they have sold: this 2017 Lamborghini Aventador LP750-4 SuperVeloce Roadster. It has been heavily customized inside and out via Lamborghini’s bespoke “Ad Personam” program. 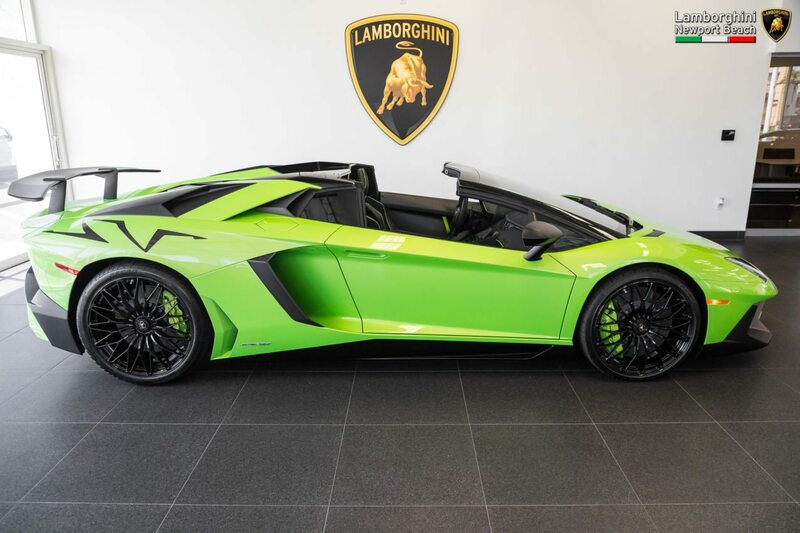 A special feature on this SuperVeloce Roadster is that the large SV logo is actually exposed gloss Carbon Fiber appearing from underneath the pearl “Verde Ithaca” paint. The entire fender is actually a Carbon Fiber piece but through the “Ad Personam” program, is able to be shown not in paint or sticker form, but gloss Carbon fiber. In addition to the Green stitching and leather accents throughout, this V12 bull features matte Carbon Fiber components inside and out including: rear bumper, rear wing, fixed rear intakes, side scoops, window scoops, front hood vents, instrument cluster trim, center media console, door panels, door sills, navigation screen bezel, engine X-Brace, T-shaped engine cover, removable tops, bucket seats, plus much more. Lamborghini Newport Beach prides itself on allowing clients to fully develop their unique vision and looks forward to future plans with Lamborghini’s “Ad Personam” program.